This tart is super simple, decadent, authentically French and probably the best chocolate dessert you”ll ever meet! Although our feet have been solidly back on U.S. soil for a week now, we’re finding our hearts and spirits frequently wandering back to the streets of Paris and to this wonderful French Chocolate Tart with Brown Butter Crust. It might be because Scott has been sorting through a myriad of pictures, choosing the best of the best for his upcoming post: “April in Paris – A Photo Journey”. Or perhaps it’s because the whole trip, now that we’re back in everyday-reality-mode, seems like a lovely dream that’s quite fun to re-immerse ourselves in. Although it would be impossible to choose a favorite memory of our week in France, one of the days we frequently reminisce about, is the one we had with Paule Caillat at Promenades Gourmandes, her delightful French cooking school. I actually shared a whole post on our market-to-kitchen culinary class, but I thought it might be fun to re-visit the experience with one of the fabulous recipes we learned that day in Paule’s beautiful Parisian kitchen. I’m not sure if it was the aura of excitement, the fine French ingredients, the expert instruction or the delightful company, but everything we prepared that day was fabulously, delicious. The menu consisted of a wonderful cheese course (and tutorial on French cheeses), a classic French salad, amazing make-ahead mini soufflés, steamed asparagus, Braised Chicken in Mustard Sauce and; the crème de la crème, a decadent French Chocolate Tart topped with fresh raspberries. I decided to share the crème de la crème today, since I brought back a block of French chocolate, and it was burning a hole in my pocket pantry. Just teasing. It’s actually a recipe I thought you’d love as much as we did, and I knew it would be perfect for the all the upcoming occasions you might have on the docket: parties, picnics, potlucks, family get-togethers. Have you ever noticed that if there’s a chocolate choice on the menu, it usually gets the most takers? This one’s great because the whole thing can be made in advance, ensuring less last moment frenzy. The crust is the same crust I used on my Goat Cheese and Tomato Soufflé Tarts. 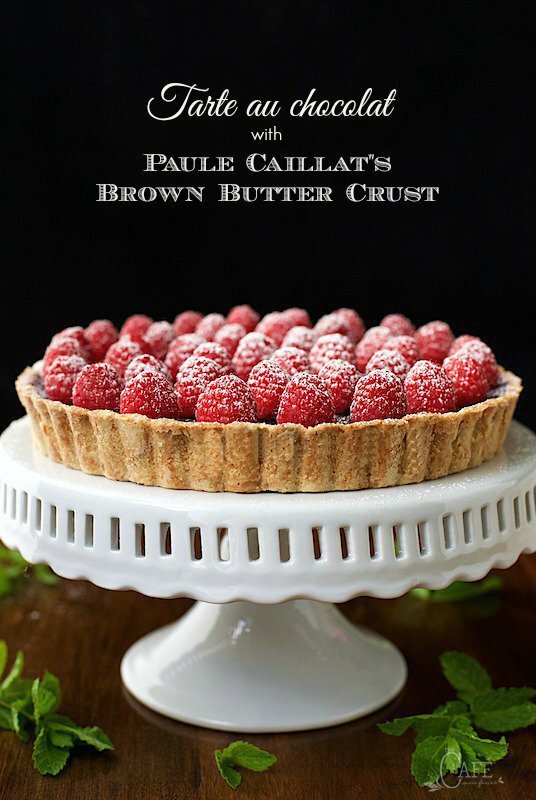 It’s one of Paule’s cherished family recipes, and she’s become quite famous for it. In fact, all you have to do is Google Paule Caillat’s Crust and you’ll find articles from Saveur, Food 52, The Kitchn, David Lebovitz and more! I love that it can be used for both sweet and savory tarts and love even more that it can be thrown together in minutes (hands on time) with no rolling or cutting butter into flour. How does that work? It’s a very unconventional technique: butter, sugar and a splash of oil and water are heated in the oven (yup, you heard right!) until the mixture is bubbly and golden brown. Remove the bowl from the oven, add a cup of flour and stir. That’s it; for a buttery, super flaky, amazingly delicious tart crust. If you don’t tell anyone how easy it is, I promise I won’t either! When you sign up for one of Paule’s classes, she has a questionnaire soliciting your preferences, so she can plan the menu for the day. I requested that she PLEASE include her famous tart crust. It was so fun to see the master herself make the renowned recipe! The filling is a fairly traditional ganache, with heavy cream. It’s heated just to the boiling point (I do this in the microwave). Add some good quality chocolate and a bit of butter, then stir till smooth and creamy. Pour this luscious mixture into your tart shell and refrigerate for at least one hour. The result? Hands down, one of the most delicious chocolate desserts you’ll ever have the pleasure of meeting! 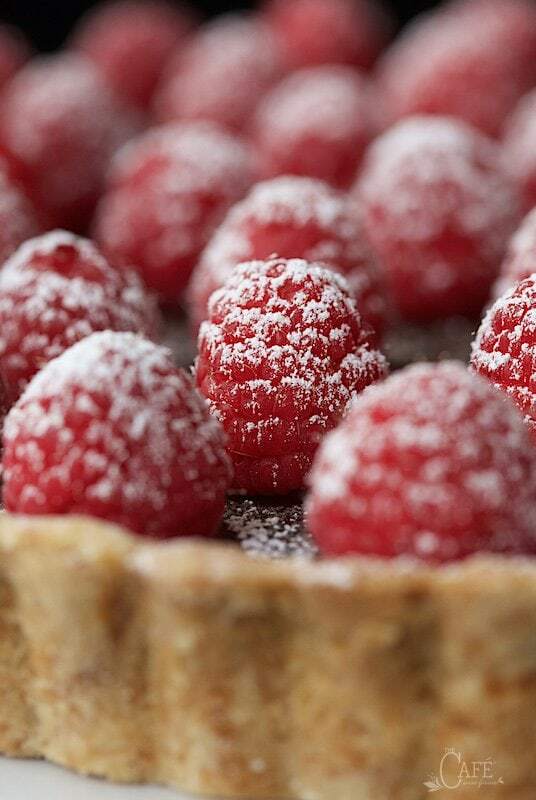 In our class, Paule topped her tart with raspberries and a shower of confectioner’s sugar. Since I’d like to be just like her when I grow up, I did the same. Strawberries or blueberries would also be wonderful, or how about a drizzle of caramel or a simple dollop of whipped cream? You’re the boss when it comes to that. 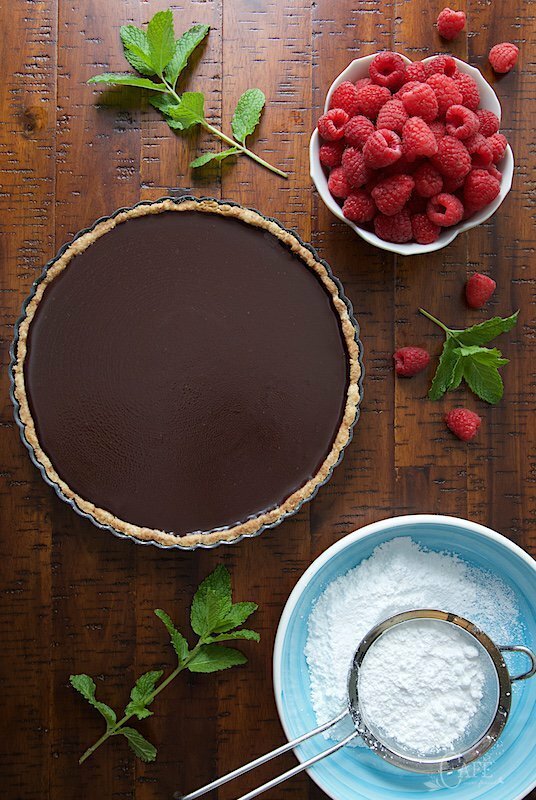 Tuck this French Chocolate Tart with Brown Butter Crust in your “have to make” arsenal! You’ll be thanking yourself and Paule over and over. When you serve it, be sure to proclaim “Bon Appétit”! 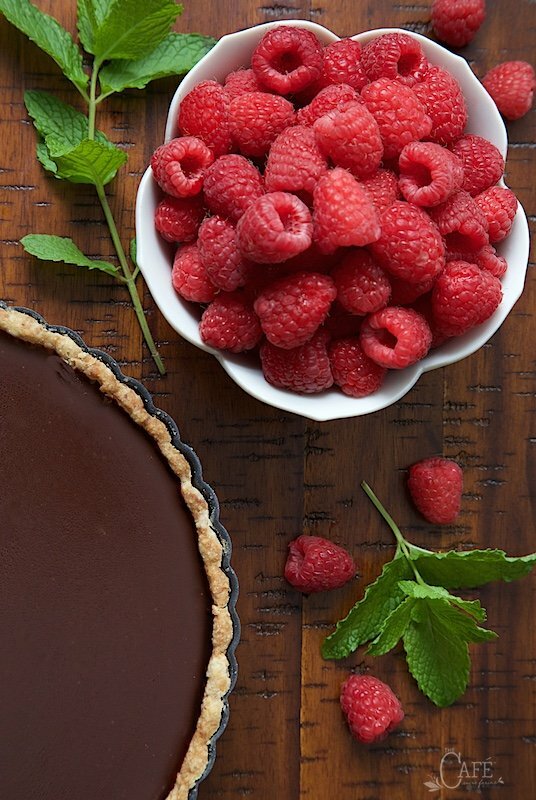 French Chocolate Tart with Brown Butter Crust - the real deal! It's super simple, super decadent, authentically French and probably the best chocolate dessert you"ll ever meet! Cut butter into small pieces and place in a medium-sized ovenproof bowl (I use Pyrex). Add the oil, water, sugar, and salt. Place the bowl in the oven until mixture is bubbling and just starting to brown, about 15 minutes. Remove bowl from the oven and reduce temperature to 375˚F.. The bowl will be very hot so handle with a hot pad till it cools down. Immediately add the flour (stand back a bit as the mixture may sputter as flour is added). With a heat-proof spatula stir until the mixture forms a ball. Pierce the bottom with a fork all over. Also press the sides of the crust with a fork to reinforce. For the ganache filling, break the chocolate into small pieces and place in a medium size bowl. Heat the cream. When it reaches the boiling point, remove. You can heat the cream on the stovetop or in the microwave. Remove it from the heat just as it starts to boil. Pour the hot cream over the chocolate. Stir with a heat-proof spatula till creamy and all chocolate has melted. Add the butter and stir well to incorporate. Pour chocolate mixture into cooled crust and refrigerate for at least one hour. Can be made up to 24 hours in advance. Top with raspberries, strawberries, caramel, whipped cream or whatever strikes your fancy! * I used a 9-inch pan. If you like the crust a little thicker, use an 8-inch pan. ** Use the best chocolate you can afford. Paula used Valrhona but there are lots of other good choices. I made this for my daughter’s 30th birthday dinner and it turned out exactly the way I had hoped. I only have an 11 inch tart pan, so I doubled both the crust and the filling, which resulted in a little too much filling, but that’s fine. Thanks so much for this impressive, delicious, but simple to make dessert that I will make again. I found the dough a, little less for a 8″ tart pan. Hi Sharmila, you do have to press it in pretty thin. I made this last night with the only semi-sweet chocolate I could afford (Chipits) which I understand is probably at the bottom of the line as far a quality chocolate goes. In the fridge it went a little bit white and “dusty” on the top, which is the only word I could use to describe it. If I set the tart out a couple of hours before serving do you think it would soften enough for that to go away? Thank you! Sorry to be so late to respond, our life has been in a bit of a whirlwind. Hope your tart turned out delicious despite the “dustiness” – I’m hoping that letting it sit out helped it! Hmm, not sure what could have gone wrong Amanda since I wasn’t in the kitchen with you. Did you use Ghiradelli 60% dark chocolate OR 60% bittersweet dark? Dark chocolate but honestly, bittersweet would also work. I’ve used a variety of different chocolates with good results. I don’t see that you mention using pie weights when baking the crust. is that something unnecessary? You are correct Kacie! That’s the beauty of this crust, it’s so easy and uncomplicated! Thanks Parul, gold… that’s the perfect way to describe it! Hi! We just left Paris yesterday and my husband is obsessed with these things but in their mini version— would you suggest to use the same recipie but just to separate into tartlet pans? Also would you change the cooking temperatures at all? Thanks!! Hi Emily, it’s always sad to say au re·voir to Paris! These tarts will be a wonderful way to remember! Yes, you could definitely make them in mini versions. Since I haven’t done it, I can’t tell you exactly how long but the baking time will definitely be less. I would keep the same temp. Would this still work with a 7″ tart pan? Hi Sarah, unless your tart pan is deeper than average, I think 7-inches would be too small. That being said, you could make it in that pan and if there’s extra filling, just make an extra one in a small ramekin. Thank you, so perhaps make the recipe as is and then cut a little out so the crust won’t be too thick and the chocolate filling won’t overflow? Yes, exactly. I’d just pat the extra crust in a small ramekin and pour the filling on top. It will make a wonderful little treat for somebody! that can be made starting Wednesday for a Friday evening event? Chris, what kind of chocolate did you use for the tart? Sounds and looks wonderful and would love to try it this weekend. Paule used Valrhona 64% Madagascar Dark chocolate and it was wonderful! Here in the US, I used Ghirardelli 60% dark and it was also very tasty. Hope that helps! Hi Susan, I’ve used both bittersweet and semisweet with good results. I just read about your cooking class and the tart over at Madonna’s, Chris. I must make this soon, as I’ve never made a crust with browned butter and it’s oh, sooo easy. One of these days, I’d love to take a cooking class in France…ooh la la…what a dream that would be.